I am a new stitcher and have never heard of this knot, definitely looking forward to the tutorial!! I have attempted a bouillon rose before but mine never stopped looking "hopeless" :) I look forward to your tutorial! Oh my goodness, I'm pretty sure those are the most precious little roses *ever*! 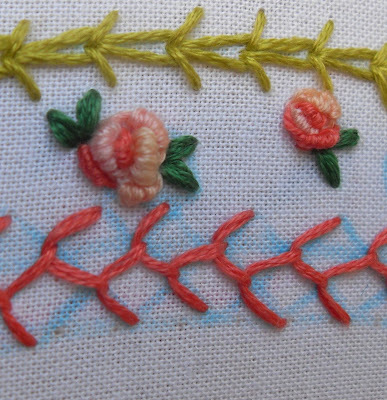 Also, I totally get that hopeless phase of a stitch / technique and I love that you are willing to show it off and let newer stitchers in on the secret (that it happens to everyone :) ). Looking forward to seeing the tutorial - I'm not sure I've ever even tried a bullion knot, now that I think about it!